VenueVision, which provides high-impact, real-time digital media solutions to automotive dealerships, has just launched its latest mobile innovation, Mobile Cashier, at Key West Ford and Kia West in British Columbia. Serving the New Westminster area, Key West Ford is the #1 new and used Ford dealer in British Columbia. Kia West, serving Vancouver, Burnaby, Coquitlam and surrounding Lower Mainland is the #1 volume Kia dealership in Western Canada. Mobile Cashier is an express e-payment solution that sends dealer-branded notifications to customers when their repairs are done. Customers can click the provided link to review their service invoice and pay directly from their mobile device or PC. Resulting in faster checkout times at the dealership. Mobile Cashier boosts convenience, reduces the 5:00pm rush and speeds up the pick-up process dramatically. This allows dealership staff more time with customers to review work completed and make recommendations for future repairs. The new express e-payment solution is designed with customer ease-of-use top of mind. “From the dealership’s perspective, I really am impressed with the level of automation and how much information is pre-populated in the forms giving very little room for error,” added Backman Galasso. Mobile Cashier isn’t just for the service department. 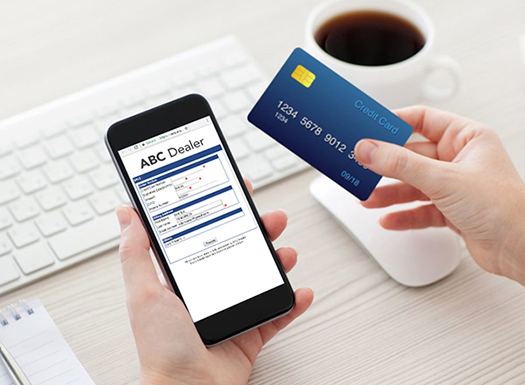 Every part of the dealership can take advantage of the easy e-payment capabilities. Parts departments can use PAY BY TEXT to allow customers to pay invoices collect for parts deposits. Sales departments can use DEPOSITS BY TEXT to collect new and used vehicle deposits faster. Even Accounting can do A/R BY TEXT to speed up receivables collection.